Just hours after we saw the first live images of the Galaxy S7, the images of the Samsung Galaxy S7 edge have surfaced keeping us in awe of the device. The live images of the Samsung Galaxy S7 edge have surfaced. Interestingly, the images not only show the handset but also the blazing benchmark results of the device. As expected, we can see the curved edges of the device but unfortunately not in use. 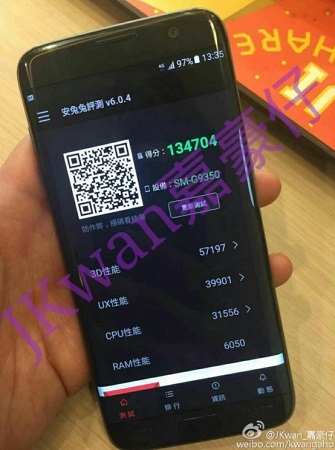 Interestingly, the handset shows the AnTuTu benchmark score of a massive 134704, hinting that the device would be a powerhouse. While 134704 is definitely an impressive score, we are unsure whether it was the Snapdragon 820 processor or the Exynos 8890. Whichever it is, it clearly is performing well. While the leak didn’t reveal the details of the handset, we can assume that the display size is indeed 5.5 inches as expected. We should be hearing more details about this soon.